Many kids of all ages are getting involved in some sort of martial arts as a sport. Martial arts training is known for improving focus and concentration skills, self-defense and self-control. In a world full of crime and violence, the idea of signing up your kids for a martial arts programme like karate might not seem like a good idea. But if your child chooses to start a self-defense sport, it is important to make sure that they’re doing this for the right reasons. 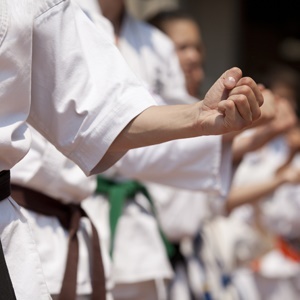 Trainers say that fighting is not the sole focus in karate but rather self-defense and the discipline to know when and how to exercise these skills. In fact, the longer you partake in Karate, the less relevant the term ‘fighting’ becomes. The goal is to commit to a mindset of being 100 percent against violence. Shihan Kenny Uytenbogaardt, a 7th Dan, well-known karate champion and teacher in Cape Town, began his training in 1965. Shihan Kenny won the title of South African Open Champion for five years running before retiring undefeated. Kenny, the style of karate that you teach and practice is Kyokushinkaikan Karate. How does this style of Karate differ from others? To understand this, we must first look back and understand the history of karate. The origins of Karate date back to 1609 when the Shimazu clan of Kyushu conquered the Ryukyu Islands. All weapons were confiscated and the indigenous clan of this island was left defenseless. And so, the Ryukyu clan was forced to utilize the study of hand-to-hand combat. From this, karate has evolved over the centuries, and different styles of karate have developed from this. In every style of karate, everybody does a punch and everybody does a kick, but each style has a different explanation. Although there are different variables in each style, they all have one common ambition; to empower and uplift the people through both the spiritual and physical aspects, where your mind and body become one. Many styles of karate have developed over the years. In the 80’s The Guinness Book of Records mentioned five main styles of karate; Shotokan, Shito Ryu ,Goju Ryu , Wado Ryu and Kyokushinkaikan (which is what I practice). Kyokushin is said to be ‘the modern, original style of karate’. Kyokushin karate is ‘full-contact’ karate. What should someone starting karate look for in a teacher or dojo? With all the new styles that have developed throughout the years, many modern karate styles break away from their original styles to commercialize karate. I belong to an original organization, one that was founded by Mas Oyama. He told me to stay with this organization as an original organization. He was my predecessor, so I must stay there and I must contribute to that organization. People who break away and create their own styles, yes they have knowledge, but a lot of substance falls away with them as soon as that happens. There’s something wrong with this. That’s not the way karate was meant to be. Our founder didn’t just wake up one day and decide to do his own thing. And so the essence of karate and what it was meant for still forms the foundation of our organization. When parents look for a dojo, logistics and convenience of location is important, but unfortunately due to those circumstances, they might end up taking anybody without proper research. What is the best age for a child to start karate? In the 60’s, it was only teenagers and seniors who practiced karate. There were no facilities for children below the age of fourteen. The demand for younger children to participate became more significant the more parents joined and wanted their children to start too. The doors then opened for younger children below the age of eleven. Internationally and in Japan a line was drawn where a child could not start karate until commencement of school, where they had an understanding of their anatomy i.e. left, right, ear, arm, leg etc. Once this was understood, a level of karate was introduced that was entertaining but the child did not have to commit to any technique that if applied could hurt or injure himself or another. This would teach a young child that karate was not based on aggression. They would first need to learn self-confidence, self-respect and most importantly respect for the seniors, teachers and parents. Is karate mostly for boys? For many years karate was only popular with the male gender. Interest perked in the 70’s where more and more women started joining in the practice. And so it became noticed that both men and women were interested in karate. What should a parent do if their child wants to quit? How can a parent motivate their child to continue? Here is what I keep telling parents: there mustn’t be a head-on collision or argument with your child when they protest against going to class. They simply have to go and there should be no discussion about it. I understand that especially for children with short-attentions spans that it can become boring in the beginning, but that’s part of the discipline. On a child’s first day at karate they’ll usually come running through the doors, screaming and shouting and they don’t bow. Once the child understands the discipline of karate, they start to enjoy it, we start seeing change. They start bowing, they start getting into it and a huge realization takes place for both the student and the teacher. This doesn’t happen overnight, it takes time. I always tell parents “I will not have failed your child if you do not bring your child to class. There is never a time to quit karate.” And you don’t stop when you get your black belt. In fact, when you do eventually get your black belt, that’s when development really starts. Anything before that is considered ‘pre-school’ in karate. This discipline needs to come from the parent. Some parents worry that Karate might make their child aggressive. What are your thoughts and advice on this? This is furthest from the truth. Concern is often raised that karate is seen to promote aggressive behavior. Over time, karate has proven to be contrary to that. Karate teaches self-control, respect and it teaches one to have a keener sense of awareness of their natural environment especially when interacting with different people at different levels on the karate floor. When I first stepped onto the karate floor, there were people of all denominations. There were doctors, lawyers, teachers, clerks, there were people on all levels of society. Some research shows that karate can benefit a child with ADHD, autism and also physical issues like core-weakness etc. In what way do you think karate can help this? Karate teaches a child to engage with all their senses. The coordination of movement in karate is most important, and this is key to any child’s developmental stages. When a child is sitting in the classroom and is unable to use his ability to coordinate these senses with the teacher, there’s a problem. I have, through the years of my teaching, received numerous letters from parents who were advised by child psychologists or doctors to bring their children to karate because they have a physical coordination problem. When these children first come to training you can see they can’t balance properly or when you call them they look the other way. I don’t want to profess to be the cure, but in each instance (and it’s happened a number of times), where teachers and parents were considering holding their kids back a year at school because their child wasn’t coping, karate has improved these skills significantly. I haven’t had any children with autism, but we’ve had a number of children who were put on Ritalin. When it comes to children with ADHD and other learning disabilities, there will always be a sense of resistance from them and this is where the parent plays a big role in making sure that their child continues attending training classes. How does karate differ from a team sport? There are no select classes or ‘teams’ for people who are thought to be ‘better’ than anybody else. It is an experience where one can interact with everybody on the floor. Everybody is absolutely equal and we all there for the same purpose. This has established a unique opportunity to experience a sense of well-being with everybody else when getting onto the training area. Karate is an individual sport. You are your own competitor. Although you are being taught by someone, you are also your own teacher when it comes to progression. It’s much like an individual sport such as running, or a gymnast. Karate takes it a step further where through training, one is always striving for perfection, yet acknowledging from the start that there is no one on God’s earth who has perfected their way of life or their technique. You might do better than someone else and there will always come a time where someone is better than you, but you can always strive to be better than yourself. You will always be a student, like I am and for me that’s since 1965. And lastly, how do parents go about signing up their kids at your dojo? Who should they contact? Why not find out about a local karate class for your child? How do you feel about your child participating in karate training?